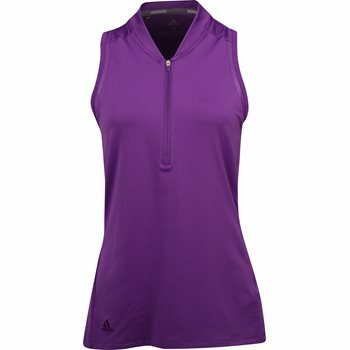 Stay dry and comfortable for all 18 holes with the Adidas Sport Mesh Sleeveless polo. It features mesh detailing around the arm holes and offers moisture-wicking to keep you cool and dry when sweating occurs. The soft stretch fabric offers unrestricted movement on your backswing and UV protection will keep you safe from harmful sunrays. The polyester construction provides durability for machine washing and resistance against wrinkles for an iron free experience. The Sport Mesh Sleeveless polo is designed with a half zip placket; a stand-up collar; and a racer back for a sleek, performance look.